Authored by Sergey Sharybin (sergey) on Feb 9 2015, 12:09 PM. "Love" token, awarded by plyczkowski. "Love" token, awarded by lordodin. "Love" token, awarded by sterlingroth. Sergey Sharybin (sergey) retitled this revision from to Cycles: implement pointiness geometry attribute. Sergey Sharybin (sergey) added reviewers: Brecht Van Lommel (brecht), Martijn Berger (juicyfruit). Sergey Sharybin (sergey) added subscribers: Pablo Vazquez (pablovazquez), Andy Goralczyk (eyecandy). Kévin Dietrich (kevindietrich) added inline comments. My bad :). I read too quickly and didn't catch it was in the 'if()' block, so it seemed over-indented. So this looks like a kind of mesh curvature, which may be a better name? Though perhaps it's ok to have a different name since this is more of an approximation. The weak point of this is that it depends highly on the number of subdivision levels, as you subdivide more the pointiness will go to zero. The algorithms to compute a proper curvature are quite a lot more complicated and slower though, so perhaps this ok and a limitation users need to deal with? @Brecht Van Lommel (brecht), mesh curvature is more a parametric property, here it is just a rough approximation. It is for sure possible to use some more accurate approximation, but that could also mean we can't use vertex attribute anymore (strictly speaking curvature of points on the face is not an interpolation of curvature on the adjacent vertices). Going more advanced is also gets complicated because the mesh storage is not best for such applications. The guys from Gooseberry team are actually testing the patch, and think if they're happy we can use current approximation as a starting point without going crazy about complicating the calculation. The thing which is really missing is tooltips for sockets. They would help making more clear what attributes mean. That would be nice to address but as a separate patch i'd say. 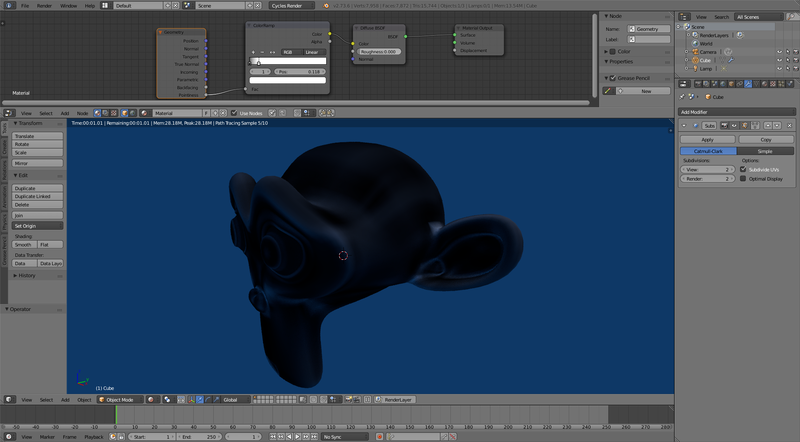 Use edges direction for pointiness calculation Normals approach didn't work totally well for non-flat quads. Added one step of blurring. so we're getting closer to 2 ring neighbourhood estimation. On the second thought it's better to avoid negative values. Much easier to map stuff with color ramp in this way it seems. This approximation gives the same value on a saddle point as it does on flat geometry while a saddle point could be considered curved. I also cannot seem to think of a better name. It would be cool to see what artists actually use this for.